Holy crud, what a weekend. The drama's been far in excess of my expectations, and it was already stacked high thanks to the quality of the teams that had made it to Tallahassee. Unlike IEM Katowice, there was absolutely no dispute that the representative teams were at the top of their respective leagues. 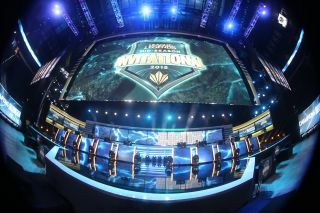 Hyperboles like "clash of titans" didn't seem too far-fetched: SKT T1 had returned to their rightful thrones at the top of Korean play, Fnatic stood victorious dripping the blood of Unicorns upon the hills of Europe, Edward Gaming is blessed with the Heaven's Mandate of the LPL, and North America's Team Solomid was coming into a tournament as one of the favored teams for once. Heck, there was even little to complain from the Taiwanese corners this time around, with AHQ's jolting sweep through the Master Series promising that they'd at least put up a fun fight. Of course, they did a whole lot more than that. The greatest thing about the Mid-Season Invitational wasn't just the clash of top teams. It was the implications that came gushing forth from the wounds and injuries they inflicted upon each other—forecasts from the entrails of hopes and dreams. The first forecast was a harsh one: North America's in for a rough ride at Worlds. The skeptics' questions raised back at Katowice seemed prophetic. Does a victory over GE Tigers, who suffered drastically with patch changes, mean quite as much against a revitalizing SKT T1? Does a victory over Team WE really mean anything when they're so lowly-ranked in the LPL, and the looming threat of EDG's growing reputation among Asian teams remain untested by the west? Well, no. The Katowice title seems a bit like a hollow crown now. TSM was studied thoroughly, and found wanting. If there was anything that unified the teams that qualified for Tallahassee, it was a reputation for abundant aggression, and Santorin in particular didn't seem to know how to handle the violence being wreaked upon his team by Fnatic's Reignover, AHQ's Mountain or EDG's Clearlove. In contrast, literally every other team knew exactly what to do versus TSM, from moment to moment. No wards were needed to understand this simple truth: where Dyrus was, Santorin wasn't. With that gospel understood, there was little to fear against the North American champions. North America itself's got plenty to fear, though. TSM's friends and rivals might have guiltily looked away from the slaughter upon their own home turf, as they share at least a little of the blame for the performance put up. The fact of the matter is that TSM is North America's number one, undisputed and peerless. Nobody else on the continent had the skills and teamwork to truly challenge them—and in their weakness, doomed their own champion to a terrible fate. There has been no better mid laner to test Bjergsen's mettle. No better support to counter Lustboy's game-changing plays. Nobody in North America that's consistently converted Dyrus's sacrificial laning phase into a game-winning advantage. The world representative teams will be leaving Tallahassee soon—and when they do, who will TSM learn from now? Who can teach them something they haven't already mastered by the time October rolls around? Maybe it's time to pull a CLG and see if Chaox can house them for a couple weeks in Shanghai. In contrast, holy crap AHQ! What a showing! Westdoor fulfilled his promise he made in a recent interview with me: they'd avenge Yoe Flash Wolves' 1-3 defeat back at Katowice, and did they ever do it with style. His cooldown Fizz was a terror from the deep—a pick that only maybe EDG's Pawn had any experience and practice with, leaving the rest of the world helpless before its trickery and cunning. And it wasn't just TSM that suffered. They were the first team to give SKT a proper scare, dragging them to the brink of defeat in the last game of the group stage—in my bias, I'd like to say that they softened them up for Fnatic's legendary 2-3 near-victory over the Koreans the day after. At the very least, AHQ came out of Tallahassee high off the knowledge that their style is finally internationally viable, with victories over both Western teams. They still have work to do, though. Even as their individual players have been impressive, organizational mistakes led to defeat by the hands of their eastern hemisphere peers. And the 0-3 defeat by EDG in the semifinals was especially appalling, demonstrating none of the vigor from the group stages. In sharp contrast to TSM, however, AHQ has plenty more room to grow and refine. They aren't even considered, individually, the best players of their region. Even Westdoor finds himself besieged for the title by the likes of Maple, Toyz and Chawy. And where Taiwan's top players can't provide enough pressure to highlight AHQ's weaknesses, no problem—the LPL and LCK are almost literally just next door, and they're already lining up to scrim. It's starting to look a lot like Taiwan's a threat—the first time that the region's garnered any respect since 2012. Been a long time coming. In fact, it's been about as long since the scene wasn't stricken with the terror of Korean dominance. The Season 2 World Championship and IPL 5 was the very last time that the Korean teams weren't the oppressive favorites. But now, even Faker's been shown to bleed. Febiven's miraculous back-to-back solo kills against the man commonly considered the best player in the world has been a thundering rally cry. AHQ demonstrated that even an oft-disregarded backwater team can put fear into the hearts of the world's best region. And with Korean blood in the waters, the sharks of China are in a frenzy. All things must come to an end, empires and legends alike. And the untouchable Korean esports dominion now find themselves besieged. This may be the year they fall.